MMA (mixed martial arts) is without a doubt the biggest thing to happen to the martial arts in the last few decades. It has seen the martial arts become mainstream as a spectator sport for the very first time and it has had a very big influence on the martial arts generally. In some quarters it is now common to divide the martial arts into the two camps of MMA and TMA (traditional martial arts), with each seen as being opposed to the other. The more “fundamentalist” MMA practitioners see traditional martial arts as archaic and ineffective systems, with the more “militant” traditional martial artists seeing MMA as lacking in discipline and depth. Personally, I think both of these conflicting viewpoints are wrong. My own take on things is that the two approaches have more common ground than is first supposed and that both approaches have much to gain if they were to emulate the best aspects of the other. Assuming that most reading this article will be traditional martial artists, I’d like to explore what traditional martial artists can learn from MMA. Although, we will discuss one or two things from the other side too. In order to put this discussion in the right context there are a few things I’d like to make clear now. Firstly, I like MMA. I like watching the sport, I think MMA has done much for the martial arts generally, and I think it has many qualities the traditional martial arts world would do well to emulate. But all of that said, MMA is not for me. All martial artists have to find an approach to the martial arts that engages and enthuses them. They need to find an approach that meets their training objectives and delivers the skills and experiences that they want. For me, that has been the traditional art of karate. It’s karate that fascinates me and that has me prepared to spend hour after hour, month after month, decade after decade training hard in order to advance what I do. For others it will be MMA that resonates with them in this way, but for me, MMA simply does not do it. It’s a matter of personal taste, and not a statement of inherent value, when I say that I need something with a deep past and a history. I like to feel part of that chain from the forgotten past to the unknown future. I like the process of delving into that deep past and seeing what is relevant to me today. MMA, as good as it is, is therefore a little “young” for me. I can however see how that “youth” would be the very thing that attracts others. So while I like MMA, it is not for me and I consider myself a traditional martial artist. This exploration of its value to traditional martial artists is therefore not done from a position of either being inherently pro- or anti-MMA. This is therefore just a look at the plain facts as I see them. The other thing we need to make clear is that I am fully aware that within MMA and within the traditional martial arts there is a wide range of views and activities. So my comments and criticisms certainly won’t apply to all and may not apply to you. So I am using the terms in a general sense, which I feel will be generally appropriate for most of the practitioners who use those labels. 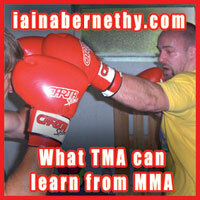 OK, so here we go, what can traditional martial artists learn from MMA? 1 – MMA is objective driven. MMA practitioners know what they are training for. They know what it takes to win a MMA bout and their training is focused on that. As I covered in the Martial Map podcast, most traditional martial artists are confused about their training objectives. They use the terms “martial arts”, “fighting” and “self-defence” like they are interchangeable; whereas in reality they represent very different things. The most common example of this confusion is art and culture being confused with practical self-defence. OK, so there are some MMA people who get confused about this too. I have had discussions with MMA people who believe that MMA is the ultimate answer to self-defence. It’s not. Self-defence has to give priority to wider personal security issues, cover escaping, cover the law, teach awareness skills etc. MMA will cover the physical “no option but to fight” side of things very well (providing they practise using those skills to facilitate escape as opposed to always fighting to the finish), but it’s a big mistake to reduce self-defence to that and ignore the more important personal security elements. All of this said, I think it would be fair to say that MMA people are generally not as confused about this as traditional martial artists tend to be. Generally speaking, MMA people train to win MMA fights. Because they have a clear objective, their training is focussed and they get good results. Traditional martial artists are often unclear why they are training. They just “train” and everything gets lumped together in an unfocused, homogonous mass. Traditional martial artists need to know what training methods will develop what attributes so the various elements of what they do will be most effectively developed. MMA practitioners tend to avoid any confusion and are more goal focused in their training. They know how to isolate skills and how to train to develop those specific skills. Generally speaking MMA practitioners are more goal focused and objective driven than their traditional martial arts counterparts. That’s not to say that MMA is better than TMA, it is simply pointing out the first element of MMA that I feel traditional martial artist would do well to emulate. The irony with much of this is that the past masters were very objective driven and hence emulating MMA in this regard is actually a return to the past. It is only when traditional martial arts “took their eye off the ball” by divorcing practise from function that this became a problem. This leads us to the issue of testing. 2 – MMA tests everything! I know plenty of traditional martial artists who do too, but I still think it would be fair to say there are many who do not test what they do. MMA practitioners test everything they do. I don’t know a single MMA person who does not pressure test and drill live. Through live drilling the MMA practitioner has actual live experience. They know what works and what does not. More importantly, the live experience helps them to learn why what works, works! They get things on a conceptual level and sound combative principles get ingrained. Things that are inherently flawed don’t survive the testing process and hence they get dropped by the wayside. They are beholden to nothing. Because of the rapid evolution of MMA, what worked 10 years ago does not work well today. They don’t hold onto the outdated material but instead concentrate on what is known to work well in the here and now. Testing would also help bring to the surface all the good material that traditional martial arts contain. One of the reasons kata is so badly understood is a lack of testing. If we test what methods work best in the close and chaotic world of close range conflict we would start to see how relevant the motions of kata are to that environment. However, because testing is nowhere near as prevalent as it should be impractical “explanations” of kata persist. These inaccurate and impractical “applications” would not survive testing and would hence disappear overnight. Karate as a whole can only benefit from that. MMA people also don’t get bogged down in the bizarre theoretical discussions that traditional martial artists sometimes do. The reason being that all theories are put into practise and hence the validity of each theory has an objective test. This is also the reason why you don’t see any MMA practitioners believing they can knock people over without touching them and other such magical feats. If you objectively test, all nonsense does not pass the test and that is why testing is so important. There are plenty of traditional martial artists who do test of course and we’ve discussed my own take on that in other articles and podcasts. My Kata-Based-Sparring DVD, Bunkai-Jutsu book and Introduction to Applied Karate e-book all contain more information on how I think testing and live practise applies to traditional karate. Before we leave this, I need to make clear that the type of testing is a vital consideration. What passes the test in a MMA bout, may not pass the test in self-defence training. For example, a successful takedown, mount and pounding would lead to victory in MMA. The same method in self-defence is likely to lead to you being repeatedly stabbed, kicked and beaten by your attacker’s accomplices as you’ve put yourself in a very vulnerable position and made it harder for you to escape. The point is that testing needs to be relevant to the objective. If we are training for self-defence then we need to live test with simulated weapons, multiple enemies, have the primary objective being escaping, etc. MMA practitioners test what they do and hence their training increases in efficiency. Because not enough traditional martial artists test what they do, things become more inefficient and impractical methods remain unchallenged. Testing should be a part of traditional practise – as it is for many, not enough however – and, as before, by emulating this aspect of MMA traditional martial artist would actually be returning to the true tradition where functionality is the key concern. This leads us to the third point. 3 – MMA is happy to innovate, and does not place “style purity” ahead of function. One of the least traditional things found in “modern traditional martial arts” is the idea that things must never change … particularly when that change can be shown to increase combative efficiency! In traditional arts, things like modern notions of “keeping the style pure”, the “semi-divine” dictates of a given master or group head, the unerring adherence to an untested theory, and so on, are all deemed more important than function. MMA does not suffer from this at all; as can be seen by its rapid evolution in recent times. The value of any technique or training method is determined solely by its functional value. If it can be demonstrated that a technique or training method can be improved upon, then MMA people tend to wholeheartedly embrace that improvement. Conversely, a lot of traditionalists view such improvements and innovations as a form of “blasphemy”, or of those suggesting the improvements “getting above their station”. MMA has a much healthier attitude to change. If something can be demonstrated to be better, then they accept that change because of its obvious value. They also see such change as the fulfilment of what went before and not the rejection of it. As an example, in the early days of the UFC, Brazilian jujutsu alone was primarily what secured a win. As MMA progressed, that was no longer the case and other skills needed to be brought into the mix. However, you don’t see MMA people slighting the contributions that BJJ made to the sport and those contributions are, quite rightly, still held in high regard. You also don’t see MMA practitioners criticising the changes to MMA as being a kind of egotistical sacrilege. MMA builds on what went before in order to continually improve … hence, both what went before and the improvements are valued. The work of trainers, teachers and fighters – past and present – are all seen as working towards a common goal and being a vital part of the growth of MMA. Sadly, the traditional martial arts, generally speaking, do not have such a healthy attitude. The result is stagnation of those quarters that see growth as being a negative and destructive thing. None of the past masters were adverse to change and growth; that’s how the “styles” they created came into being in the first place! Gichin Funakoshi wrote in “Karate-Do: My Way of Life” that, “Times change, the world changes, and obviously the martial arts must change too”. It’s quite sad that many “modern traditionalists” disagree with him. Once again, what is frequently and widely accepted as being “traditional” is not and, perhaps paradoxically, the attitude MMA has to change and growth is more inline with the thinking of the past masters. Here we see that, as a student, Funakoshi was encouraged to learn methods from other teachers in order to make them part of his karate. There is no worry about “perverting the style” only a desire to ensure Funakoshi was exposed to the best methods out there. None of my teachers followed the example of what Funakoshi would call “ordinary karate instructors”. They all encouraged me to seek out what I could find and, if I found something of value, to make it part of what I do. Sadly many others are forbidden to train with people from outside their dojo or school and brining in other methods is often seen as a kind of treason. Obviously a “free for all” is not good and junior students are not well placed to be able to objectively assess the validity of any methods. However, I’ve seen 3rddans and above actively discouraged to seek excellence and to make it part of what they do. If people are incapable of making solid value judgments at that point you have to question the training that led them there. In MMA it is very common for the top athletes to seek instruction from specialists to improve various aspects of their game. They will have a wrestling coach, a boxing coach, a BBJ coach, a conditioning coach and so on. It is acknowledged that no one person can be an expert in everything and hence you will not find the best answer to everything from one single person. Traditionalists sometimes hold the opposite view that a single master or his methods (i.e. the style he formulated) will be supreme in all regards. This is obviously flawed and can be extremely limiting. In my case, I have always sought to take the best all my teachers have had to offer and to make it mine … and all my teachers always encouraged me to do just that. They knew what their strengths were and their egos were not so fragile that they demanded I remain blind to where they were not so strong. They wanted the best for me. I remain loyal and grateful to them all as a result. As one of my teachers – Peter Consterdine 9thDan – once said, “as soon as you try to build walls around people the first thing they want to do is climb them”. It’s an example I try to follow and I know were I am strong, were I am competent and were I am weak. I want my students to build on what I give them and seek out instruction for the areas which are not my field. It’s for this reason that we regularly have other people teach in our dojo and why my students regularly attend the seminars of other teachers. I’m not done myself of course and I’m still trying to improve what I do for myself, to honour my teachers, and to ensure I do the best by my students. However, for many, the way I approach things is seen as a rejection of that which came before me rather than a fulfilment of it. I am aware that some traditionalists see me as a heretic. That’s totally OK though as many other traditionalists feel what I do is as traditional as it gets and see me as a great supporter of the traditional arts. Ultimately, none of that really matters so long as I’m making progress myself and those training with me benefit from doing so. At the end of his Shito-Ryu Shuko-kai kata manual Haru-yoshi Yamana 9thdan (a student of Tani; the founder of Shuko-kai) – who I once had the pleasure of interviewing for Traditional Karate Magazine and who I trained with on a few times when I visited Japan – wrote, “I conclude by saying, as my honoured teacher before me, I am not content just to teach, but wish to contribute my experience to the study of karate.” I really like that. I think we all have an obligation to add our personal experiences to karate – through the Shuhari process explained in my article “Styles: Are they killing karate?” – and not just pass it on having made absolutely no contribution ourselves. We should therefore all seek out the best instruction we can, and aim to become the best martial artists we can, so that our contributions are of value to those who come after us. MMA seems to inherently get this idea and that is why MMA has evolved much; much more in its short life than the traditional arts have done in the same timeframe. There are some who hold that the traditional arts have reached “perfection” and hence can evolve no further. However, I think this deluded view is simply a result of a lack of testing that we mentioned earlier. Innovation and evolution with a view to ever increasing efficiency were fundamental to the traditional martial arts. Sadly that has been lost by many “traditionalists”. Again, if we were to follow the example of MMA in this regard we would be returning to the true tradition and would reap the benefits of doing so. 4 – The importance of physical conditioning in MMA is fully understood. From both a practical and lifestyle perspective there are massive benefits from being in shape. Obviously the extreme level of fitness of the elite MMA athlete is something beyond those not training fulltime. However, even recreational MMA practitioners understand the importance of being in good condition. The training reflects this and has a solid physical component. Many traditional martial artists barely break sweat in practise and this does not prepare them for the rigours of conflict, nor does it bring positive health and lifestyle benefits. One of the things that always amuses me is the low value placed on martial arts by the British medical services. On every health check up I have had the doctor has ranked the martial arts below the jogging etc that I do. When I ask why marital arts are viewed as having little heath benefits, I’m normally told it’s because they don’t raise the heart rate enough. Don’t raise the heart rate enough!?! It sometimes feels like my heart is about to beat its way out of my chest in a bid to escape what its being put through! The reasoning behind this is probably accurate though. For most, the martial arts probably don’t raise the heart rate enough due the pedestrian way in which they are practised. It’s quite common to see karate dan grades who are out of shape. I don’t mean that all dan grades need to be hyper fit, but – assuming they are not ill or injured and unable to train – they should also not be several stone overweight and out of breath having walked up a few flights of stairs. You simply don’t see out of shape MMA guys with the same frequency you see out of shape traditionalists. It is my view that traditional martial artists would do well emulate their MMA counterparts in this regard too and to ensure that physical conditioning and hard training are par for the course. Having talked about the areas were traditionalists would do well to emulate MMA practitioners, we should probably quickly touch on the other side of things. Low level MMA practitioners generally don’t spend enough time developing technique to the level traditionalists do. There is frequently an almost obsessive level of detail when it comes to traditional martial arts that begins with the very first class. A lot of people starting MMA simply want to get “stuck in” and some poorer gyms cater to that. Without strong foundations, it’s impossible to build to a great height. Poor quality MMA practitioners sometimes limit the level they can reach through poor quality foundations. Traditionalists often limit their level by spending all the time on the foundations and never building upward. Traditionalists also tend to place a greater emphasis on humility and hence are less prone to some of the more aggressive and arrogant attitudes we see in some quarters of the MMA world. The infusion of desirable character traits into training is therefore something that could be of benefit. All the way through this we have been talking in generalities, but it must be understood that these generalities can obscure the detail of truth of the situation. I know lots of MMA practitioners who have amazing technique (just watch any high level fight) and who are really nice people. I also know plenty of traditionalists with very poor technique who are insecure, arrogant and who are no fun to be around. Although we can see general trends, all approaches have good and bad within them. No one approach can be universally deemed as the ultimate. Whist they may not be the majority, there are many traditionalists who ARE objective driven, who do test everything, who are happy to innovate and build on what went before, and who understand the importance of physical conditioning. Likewise there are MMA people, at all levels, who have incredible technique and who are really good people. The “stereotypes” (if we can use that word in this context) of MMA and traditional martial arts exist for a reason, but they are far from universal. The bottom line is that the best in MMA and the best in traditional arts will share many common traits; just as the worst in both will too. Ultimately it is not “WHAT” we do, but “HOW” we do it. The best MMA practitioners and the best traditionalists will probably have far more in common than the best traditionalists will have in common with the worst traditionalists. What determines common ground is, as just mentioned, not what we do but how we do it. Many of the good things that MMA does were also encouraged by the masters of the past. However, it does not really matter from where excellence originates. Best practise is best practise and we should always emulate excellence whenever we can. By not looking at what other approaches have to offer, and what we can learn from them, we lose the opportunity to improve and make objective critical comparisons with what we currently do. Remember that Gichin Funakoshi, the farther of modern karate himself, said he was urged by his teachers to learn what others excelled at. I think we should follow his example. There is much that MMA gives us traditionalists to emulate and we would be foolish, even untraditional, to ignore those things.